The premise is deceptively simple: Follow a boy from Texas, a child of divorce, as he grows from ages seven to 18, from kid stuff to the brink of college and adulthood Documentarian Michael Apted attempts something similar in his ongoing Up series. But Linklater is crafting a movie, a fiction featuring actors and a script. Mason, played by the remarkable Ellar Coltrane, interacts with dad Mason Sr. (Ethan Hawke), mom (Patricia Arquette) and sister Samantha (a sass queen luminously acted by Lorelei Linklater, the director’s daughter). Their acting is of the highest rank. Hawke and Arquette have never been better and Coltrane gives a performance that will be talked about as long as audiences talk about movies. Shot in 39 days and covering 12 years, Boyhood flows seamlessly over two hours and 40 minutes as we watch characters age, argue, reconcile, mature or not. Hawke excels as a mostly absentee dad, while Arquette brings a poignant urgency to a mother hobbled by her knack for bringing home the wrong men. But the film belongs to Coltrane, especially as he shows us Mason coping with the perils of pursuing a career in photography and his school’s hottest girl (Zoe Graham). Linklater never overplays his hand with tear-jerking or dramatic excess. He knows the boy’s heart, and in the process he captures ours. 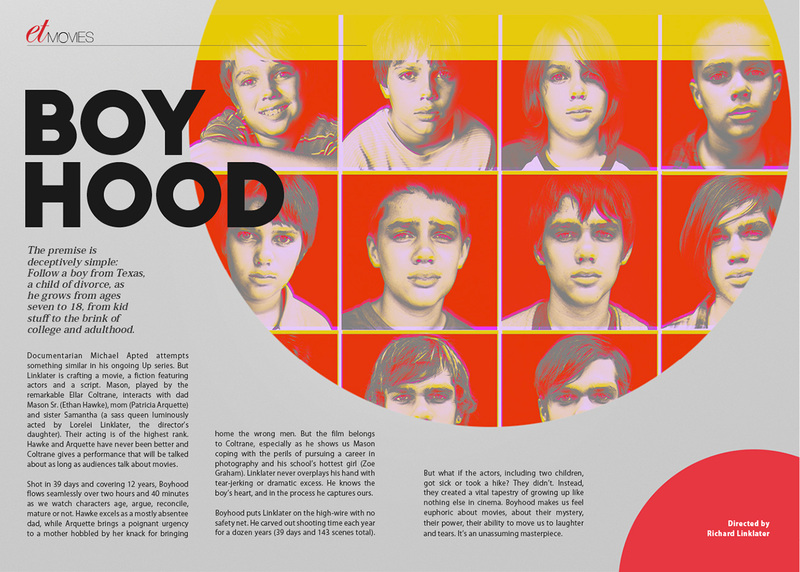 Boyhood puts Linklater on the high-wire with no safety net. He carved out shooting time each year for a dozen years (39 days and 143 scenes total). But what if the actors, including two children, got sick or took a hike? They didn’t. Instead, they created a vital tapestry of growing up like nothing else in cinema. Boyhood makes us feel euphoric about movies, about their mystery, their power, their ability to move us to laughter and tears. It’s an unassuming masterpiece. © 2019 etMagazine. All rights reserved.